CLEVELAND — Wow! What a journey this has been! 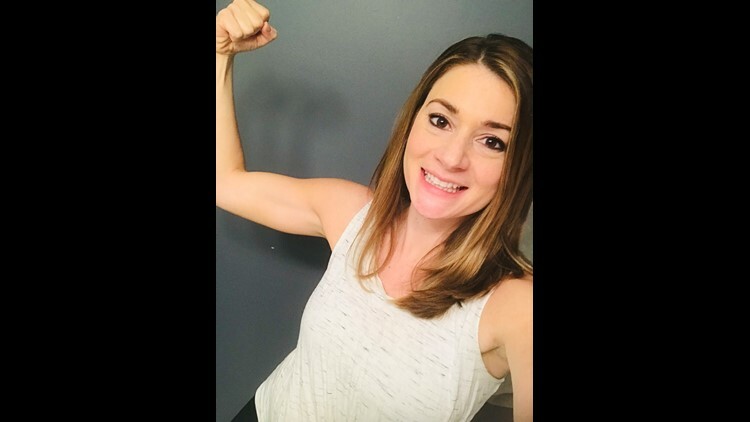 Our own Maureen Kyle was dared to take on the 10-day challenge by Hoda Kotb of the Today show last week -- and she accepted that challenge alongside Hollie Strano. The craze gained national attention last month when Jennifer Lopez and Alex Rodriguez challenged Kotb to give it a try. You can follow Maureen's progress every day inside this post. Be sure to follow her on Facebook, Twitter and Instagram for more tips and tricks if you want to try the diet yourself. On Sunday, Maureen prepared her FAVORITE vegetable soup to help her get through. It's all veggies. And it's SO good. The secret is the lemon juice you add to it. Join in or just follow along! Either way, we hope it's inspiring. 1. To a large Dutch oven or stockpot, add the oil, onion, celery, and sauté over medium-high heat for about 7 minutes, or until vegetables begin to soften. Stir intermittently. 2. Add the garlic and sauté for another 1 to 2 minutes. Stir intermittently. 3. Add the cabbage, peppers, carrots, green beans, mushrooms, and sauté for another 5 minutes, or until vegetables begin to soften. Stir intermittently. 4. Add the vegetable broth, diced tomatoes, optional beans or edamame, bay leaves, cumin, oregano, thyme, rosemary, optional cayenne, salt, pepper, and bring to a boil. Allow mixture to boil gently for about 5 minutes. 5. Add the broccoli, zucchini, optional lemon juice, and boil 3 to 5 minutes, or until broccoli and zucchini are crisp-tender. Remove bay leaves. 6. Taste soup and add additional salt, pepper, or herbs, to taste. Amount of salt will vary based on how salty the brand of vegetable broth used is, how salty the canned tomatoes and optional beans are, and personal preference. At any time while making the soup, if the overall liquid level is lower than you like and you prefer more broth, adding a cup or two of water is okay, noting you can always adjust the salt and seasoning levels. Serve immediately. Soup will keep airtight in the fridge for 5 to 7 days or in the freezer for up to 6 months. As the second day begins, we just so happened to have a story about donuts. Yep. Donuts. By day two of the #10DayChallenge, you should be pretty hungry and missing your favorite foods. I know this because I've done these sugar detoxes before. It's not easy! But as long as you plan out your meals, you'll set yourself up for success. Breakfast: Two eggs scrambled with a few cherry tomatoes and broccoli. Snack: Roasted cashews, walnuts or almonds. Lunch: Mixed greens salad with bell pepper, cucumber and grilled chicken. For the dressing, I use just balsamic and olive oil with salt and pepper. Snack: Avocado with salt and pepper. Dinner: Grilled chicken or salmon with roasted broccoli and sautéed brussel sprouts. Another favorite is sautéed Swiss chard! Use olive oil, onions and lemon juice. I promise this dark green looks scary, but is delicious! I also made a snack of rosemary roasted walnuts today. Take 1 cup of walnuts, toss it with olive oil, salt, pepper and rosemary. Bake it in the oven on a cookie sheet for 10 minutes at 350 degrees. It satisfies that "French Fry" craving. Best of luck! And follow along with my progress on Twitter, Instagram and Facebook. I'm tired. I'm cranky. I have toddlers. Day three of any "diet detox" is always the hardest. In the past when I've done these, I've experienced cold sweats, headaches and moodiness. This is all a sign of my body getting "unhooked" on processed foods. And even though I know this, it's still really hard. And, as Murphy's law always proves, today is "Ice Cream Day." Jack Frost Donuts delivered what looked like piles of heaven shaped like an ice cream cone. Then someone dropped off ice cream cake to the newsroom. It's safe to say Hollie and I had to hunker down at our desks and not make any sudden movements or else we would fall off the wagon. Hard. But there's a way to make it over this hump! Every dietitian I've ever interviewed recommends "good fats" to fight cravings. So, my go-to? 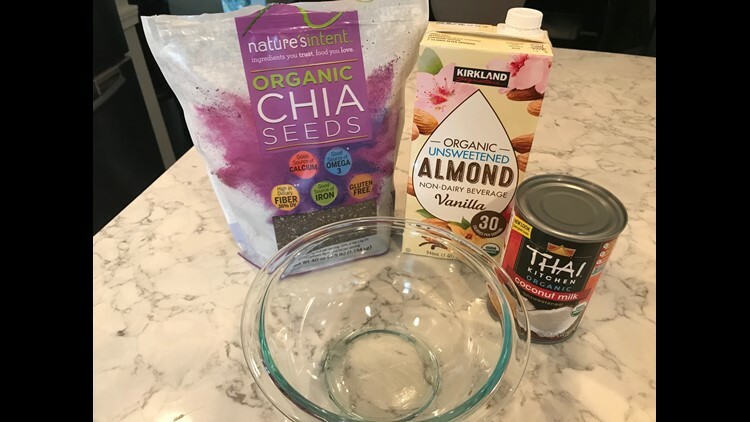 Chia seed pudding. (Yes, chia, like the pet/plant). Mix it all together and let it sit for five hours or overnight in the refrigerator. Eventually it becomes a pudding-like consistency. At this point, all of you eating your ice cream and reading this think I'm totally crazy. But for all of you who are trying to cut the sugar, this works. And if you're allowing yourself fruit or sweetener (honey, maple syrup, etc.) add that to the mix and it's a perfect dessert! Taking on this challenge, there was certainly a number of people who told me "there's no way I could ever do that." Of course, that leads to self-doubt. Can I pull this off? But waking up Thursday morning to Twitter messages and Instagram comments saying "I'm on Day 4, too!" was so encouraging. I'm surprised at how many people jumped on this bandwagon! And not only joining in, but also sharing recipes or meal ideas. As we all know, it's easier to stick to a diet if someone else is doing it with you. The American Psychological Association cites a study that says "participants who enrolled in a weight-loss program with friends did a better job of keeping their weight off. Weight loss is just one small goal within this #10DayChallenge. Overall, we want to focus on feeling better, right? And in 4 short (ok...sometimes they felt long) days, I'm already feeling an increase in energy and positive mood! Keep it up, friends! And thank you for helping me over the hump. I made it through the work week unscathed! I know a lot of you agree (because this is what you tell me), that office temptations are the biggest downfall to a diet. Someone brings in cookies or cake or has a candy dish, and your diet goes out the window. But making a habit of saying "no" at work starts to stick once you get through the first week. Week two is even easier. And then by week 3, you don't even notice the "temptation island" next to the copy machine, right? With this #10DayChallenge, there's no "cheat" way to get sweets. All sugars, fruit and sweeteners are not allowed. Blend it all in a high powered blender. Mine even got a little frothy. Look -- It's not going to taste like a milkshake. But the cinnamon gives you that spicy/sweet you might be looking for and it's filling. We are in dangerous territory now... Saturday and Sunday. There was no way I was going to put plans on hold and not go out with friends! But how could I possibly stick to the restricted diet?!?! Guess what...It was easy. And at this point, I feel so amazing, I wanted to keep this feeling going. My friends and I went to Forage in Lakewood. I looked at the menu ahead of time and identified which dish I could alter to accommodate this diet. I ended up with a Greek salad with chicken on top. Sure, it was no indulgent meal, but I wasn't left out of the fun. My pitfall almost came when I ordered a side of spicy cauliflower. I didn't realize it was lightly breaded, so I had to pass. My husband gladly took one for the team and ate the whole entire side. It hurt a little when everyone raved at how amazing the cauliflower was and how it was worth every bite. But I stayed strong!! - WAY more energy. I don't even need to catch a nap during the day. For someone who is up by 1:45 every morning, that is a huge feat. - No cravings. My downfall is sweets after meals. With this challenge, I don't even want anything sweet or junk food. I also find that I'm less hungry, which helps me control my portions. - Less inflammation. This is the fancy way of saying my pants fit better. I can tell my body is reacting to the right foods and I feel much lighter. - A few pounds gone. Look, it's only been 7 days. So, I'm not going to expect to lose 20 lbs. But I have lost about 5. I'm sure if I keep this up, I could possibly lose more. So, can I keep this up? Only a few days left. Ok ... enough of the broccoli. When I started the challenge, I thought "No problem. Chicken, broccoli, chicken, broccoli." But that starts to get old. Fast. I had to go seek out variety in the vegetable department. With Pinterest and a little creativity, I pushed myself to find new side dishes. I tried chicken stir fry with cauliflower "rice" (it's just diced up cauliflower) and even the kids ate every little bit. I found recipes for vegetable "meatballs" made up of zucchini, bell peppers, red cabbage with egg to bind it all together. Exploration opened up my food world! Eating this way isn't boring - I was boring with what I thought of as vegetable sides! This also makes me realize, I can keep this up for many many meals to come. You go through the mind-set of "get through the ten days" and find yourself thinking "wait, this is how I should eat 7 days a week." I think Hollie can agree with me: this challenge has been completely eye-opening. Let's talk about weight loss. I'd LOVE to tell you that I'm down 15 pounds or something even more outrageous. But I've stepped on that scale every day. At best, I'm down about 5 pounds (And I'm 7 months post-baby...there's weight to lose). But before I reach for the comfort of my good friends Ben and Jerry, I noticed something in the mirror: I see muscles. Foods like dairy, gluten and sugar are all inflammatory. I've done enough interviews to realize that. You've heard it, too. What's amazes me is that cutting those foods out for a week made a visible difference. And I'm not hallucinating due to lack of sleep. All of my clothes are fitting better. I'm sitting up straighter because my abdominal muscles feel more toned and less bloated. When I first started this 10 day challenge, friends messaged me saying "How are you going to do this??" Now the question I'm asking myself: "How am I going to stop?" I can't even begin to describe how great I feel overall. My mood is better, my energy is higher and I look better than I did 10 days ago (in my humble opinion). Yes it's hard. Yes I miss cookies. But I also realize the sacrifices are give and take. Hollie and I agreed about this: After you eat only whole, natural foods for this short period of time, you understand what your body needs and what it really wants. Treats will be treats. Chocolate will be in my life. But most of the time, I will be more mindful to eat like J Lo ... Or Hoda... Or I guess, myself.